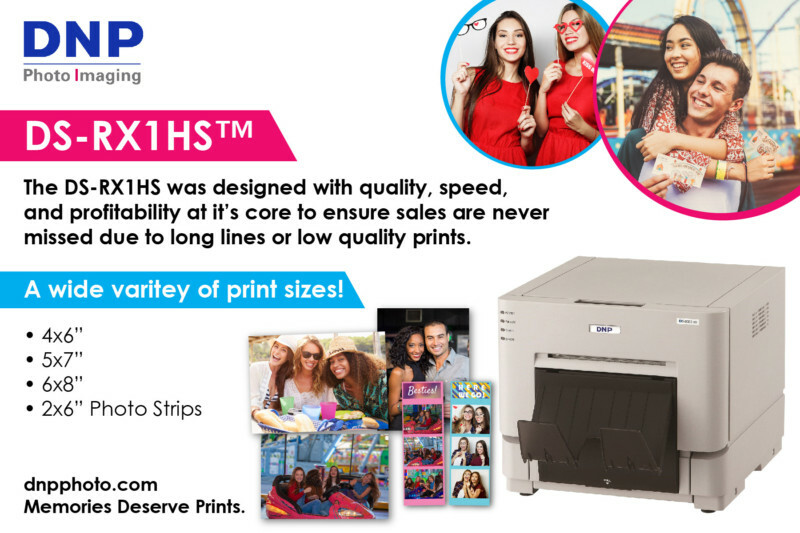 CONCORD, North Carolina — DNP Imagingcomm America Corporation (DNP IAM) has introduced its new DS-RX1HS™ dye-sublimation professional photo printer for the amusement and attractions industry—improving print speeds by as much as 20 percent. Ideal for ride photo systems, photo booth applications, and other attractions where customized souvenirs are desired, the DS-RX1HS combines inexpensive hardware and print media cost with high-e nd capabilities to provide a profitable solution for producing instant custom photo prints. The DS-RX1HS features increased print speeds that allow users to produce 4”x6” prints in 12.4 seconds or up to 290 4”x6” prints per hour. The printer offers capacities of 700 4”x6” prints and 350 5”x7” and 6”x8” prints as well as the the ability to print two 2”x6” photo strips on 4”x6” paper, and four 2”x6” photo strips on 6”x8” paper. Built with a rugged, durable design, the DS-RX1HS is 12.6” wide by 13.8” deep, by 11” tall and weighs less than 30 pounds The printer features both a high speed mode (300x300dpi) and a high resolution mode (300x600dpi) in glossy or matte finishes. The printer includes improved operational support with the addition of USB iSerial for printing to multiple DS-RX1HS printers and a new Status App for Windows OS for real-time monitoring, including media type loaded, prints remaining, printer status, total print count, firmware version, serial number, and color control data. DNP has also introduced a companion consumable ink ribbon and paper media set for the DS-RX1HS. The printer requires the new RX1HS media for printing, as current-generation RX1 media is not compatible. The media set includes 4”x6” and 6”x8” paper media with the option to produce two 2”x6” strips on 4”x6” prints or four 2”x6” strips on 6”x8” prints. The DS-RX1HS printer and media set are currently available in the United States, Canada, the Caribbean, Puerto Rico, and the following Latin American countries: Colombia, Mexico, Peru, Chile, and Ecuador.